Frederick John Yates was born 9th July 1850 in Bromsgrove, Worcestershire. He grew up around the High Street area of Bromsgrove with his parents Samuel and Marianne, his two sister's Sarah and Mary and brother Edgar. Just a few years later he married Jane Dennis Wilson on 18th July 1876 at St George the Martyr, London and the pair set up home back in Bromsgrove, New Road, just round the corner from where he was born. 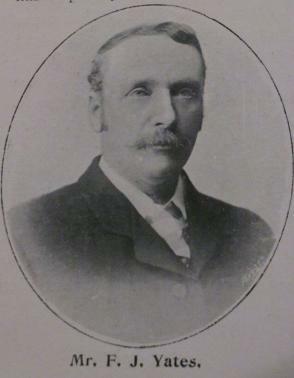 Frederick was gaining a reputation in the Worcestershire area and some of his early work was for the Bromsgrove School Board and Wesleyan Church, along with various local residences in Malvern and Lickey. 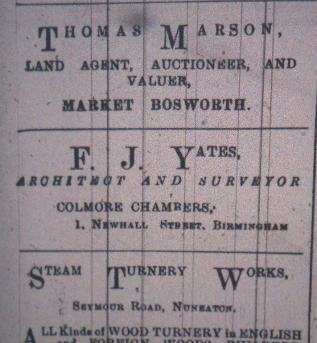 I'm guessing that Stanley and Yates' paths crossed because of the church connection and soon enough the duo were drawing up plans to build all over Nuneaton. He worked on various projects in the town for Reginald, all having their own little story. Click on the names below to take a look at their page. The Gate Hotel, The Cottage Hospital, Manor Court, Nuneaton Liberal Club and various Wesleyan Churches all had the F.J Yates stamp on them. He also designed many of the houses on Manor Court Road. Frederick John Yates had a massive say in the late 19th, early 20th century design of Nuneaton and he deserves a big pat on the back for giving this town some amazing buildings, past and present, without his input and skill, the places above would never be with us today. Below is a couple of his work that didn't involve Reginald but where in the area. A big thank you to the Library of Birmingham, the Royal Institute of British Architects for their kind help. I sent many e-mails and phone calls to these places, along with a few visits to Birmingham to find a picture of F.J Yates. P.S The Library of Birmingham is an amazing place and everyone should go and take a look round. Left - The plans by F.J Yates of the Free Methodist Church and Right taken from the Methodist Conference booklet. Quite possibly this became Frederick's last project in Nuneaton and on Saturday 3rd October 1903, the small band of Free Methodist were celebrating the occasion by laying the first stones of the new Chapel on Heath End Road. 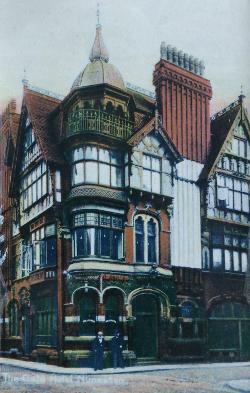 The architect as we know was F.J Yates a fine designer of his time and the lucky man who was charged with the building was Mr George Smith of Chilvers Coton. They couldn't have asked for a finer afternoon to perform this ceremony, the sun was out and friends from various denominations had met locals in front of the parcel of land soon to be their new home. To set the scene and how they ended up at this point, the original foundation of the church started with Issac Gunn, John Flood and William Broadway. They had formed a small band of Methodist's meeting in John Flood's home on Sundays and Wednesday it was Isaac's house for prayer meeting. Soon after they had to rent a house in Bond's yard (See map below just off Heath End Road close to where the Church now stands) they where growing and growing by the year. 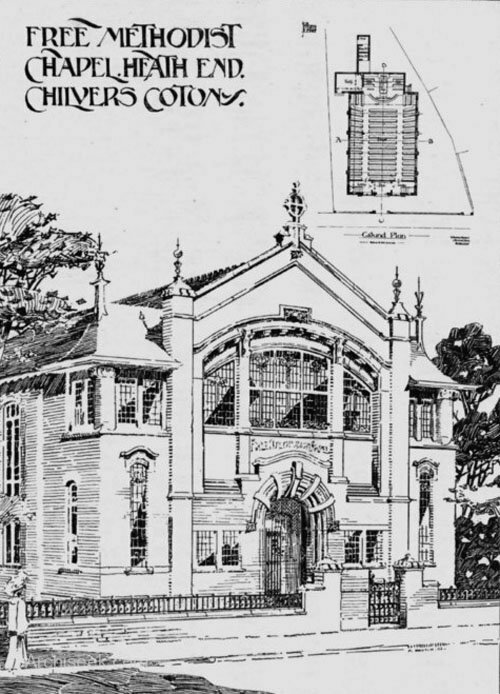 So by 1855, a Chapel was built to seat 100 and by 1885 they had added a small school, vestry, pulpit and gallery with added seating and heating system. Owing to the increase in members they set about purchasing land in 1900 and those original members all those years ago would be proud by this day. Map of 1902, just before the new Church was built, the old Chapel is still here and Bond's Yard, I think, is somewhere near Sonny's Shop now. Back to 1904 and the scaffolding had flags flying in the gentle breeze and on the platform was Rev W Marsden (President of the Wesleyan Reform Union), Mr W Shirley (President of the Foleshill circuit), Mr Thomas Hill (Secretary), Mr John Gunn (Superintendent of the Sunday School), Mr Hollis, Mr Golby and Mr Boffin (treasurer). Rev Marsden spoke a few words about the Reform movement and how they were in a sound financial position with Churches being built all over London. Mr Shirley then took the stand he spoke of the first Chapel, his father preached at the original Chapel and in those forty years only a handful of the first members are still with them. He asked for God's blessing on the work ahead which the gathering duly applauded. The stone laying took place Mr James Hankinson and Mr J Corbitt laying the first stones, on behalf of the Young Women's bible class, and Mr John Gunn for the Young Men (see below). Various other bricks where laid including over 92 scholars from the School. It was close to 5pm by the time they sat down to a small tea, set out in a marque opposite the old Chapel. A few locals stood up to speak including a Mr W Golby, Mr G Ely and Mr John Gunn. On Saturday afternoon the scheme promoted by Mr David Barr of Beech Lane, Birmingham for the building cottage homes for Wesleyan local preachers at Fillongley, was inaugurated in practical form by the laying of foundation stones. The obligations of the Wesleyan Church to its local preachers is generally recognised to be great, and it is found that some of the men after a life spent in toil on weekdays and Sundays, are at last without provisions for old age. The Local Preachers Mutual Aid society does something to help but Mr Barr came to the conclusion two years aho that the provision of homes would be very welcome to poor brethren. So he launched a scheme for erecting cottages at Fillongley, near the Wesleyan Chapel and within a mile of Arley Station on the Midland Railway. It is believed that this is the first scheme of the sort among Wesleyan's, and its development will therefor doubtless be watched with special interest among Methodists. When Mr Perks M.P recently launched the Wesleyan Twentieth Century Fund by raising £1,000,000 it contained no provision for these preachers, but Mr Barr has urged Mr Perks to make some provision whereby a deserving class may benefit. The weather was damp on Saturday ad the attendance especially of friends from a distance suffered. Among those present were the Rev W Harris (London, originator of the Local Preachers Mutual) Rev S Parkes (Birmingham) Rev J T Ward (Stafford) Messrs D.Barr, A Barr, J Blackham C.C, H Sunderland, C Britten, Britten Jnr, F J Yates (Architect of the Buildings and Bowen (Builder). A short religious service took place and the foundation stones were laid by Rev W Harris, Mr Barr (for Israel Parkes) and Mr A J Leeson. 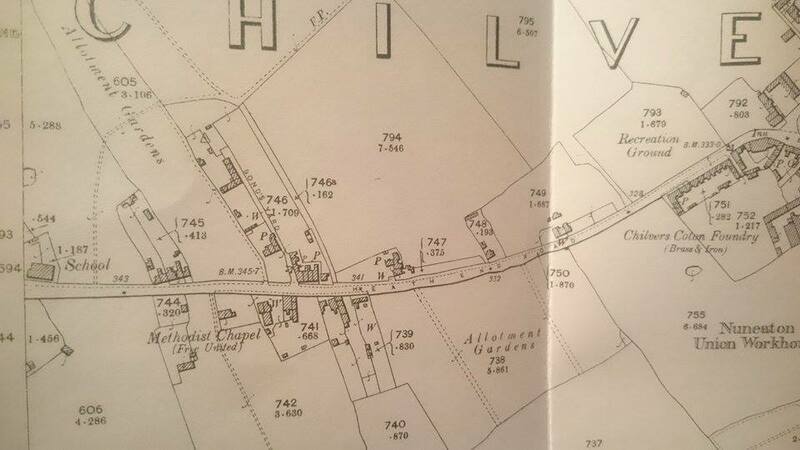 The cottages are on the road from Fillongley to Nuneaton, will be substantial buildings, seven in number. The outdoor ceremony did not occupy much time, the weather being so inclement, but addresses were given in the chapel by ministers and laymen. Mr Barr in a financial statement said the estimated cost of the scheme was £1,253, and close upon £300 would be needed after all the money promised or expected had come in. He hoped there would be no debt on the cottages when they were opened (cheers) He had received many proofs that the provisions of these homes would be very welcome to men who had spent long years in the service of the Wesleyan's, and who, therefore, had strong claims on the support of the church. The Rev J T Ward said these men deserved well of them, and sacerdotalism so rife in the present day.The Rev W Harris appealed for local support, and stated that many cases of need among preachers came before the Mutual Aid Societies of which he had been president. Mr James Blackham who presided at the meeting held in the even said he as a local Churchman, welcomed the establishment of these homes in Fillongley. above - someone attempted to replicate the plaque, but left it in an unfinished state. (1) Taken from Birmingham at the turn of the Century.